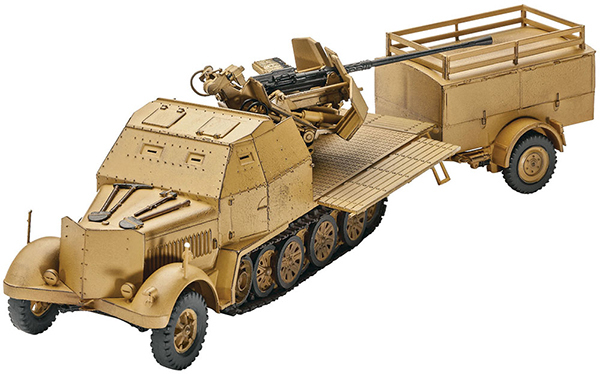 Originally designed as artillery tractors, later versions of the Sd.Kfz 7-8 tonne tracked infantry vehicle were used as mobile anti-aircraft platforms. Early in the war, German commanders were able to rely on near total air superiority in every attack. Attrition in the Luftwaffe, however, rapidly eroded the air advantage of Nazi Germany and necessitated the deployment of more and increasingly sophisticated anti-aircraft weapons. 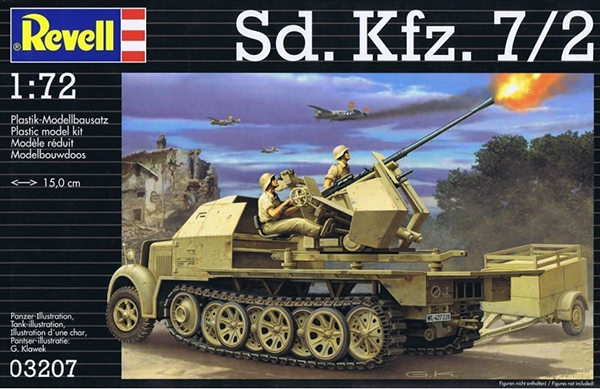 The armored cab and 37mm autocannon of the Sd.Kfz. 7/2 made for a lethal instrument of war, but it relied on pull-behind trailers for its ammo supply. Kit features detailed interior, one piece bendable injection molded track plus four German decal sets.